Another classic. 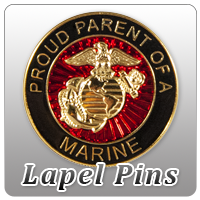 Gold tone and red, "My son is a Marine" for every proud parent! Sticker whent on great with no air bubbles. looks great on our pickup. Thanks! I HAVE A SON THAT IS A MARINE AND A DAUGHTER AS WELL, IS THERE A STICKER FOR MY DAUGHTER? 05/24/13: We contacted this customer to let them know we do have "Daughter" bumper stickers.